All coffee mugs are not created equal. Sometimes, you need your coffee to stay warm for more than five minutes. That’s where these coffee mugs come in! We’ve put together this coffee mug buying guide so that you can find the mug that’s going to get your morning off to a great start. Here are some things you should know about the coffee mugs we’ll show you. Get ready to get caffeinated. Capacity: It’s important to know how much the coffee mug can hold before you order. If you are prone to drinking a ton of coffee, you will naturally want a larger mug than someone who drinks it casually. Color Options: How many color options do you have? Mugs are a great way to accessorize, and especially in mugs, you’re taking with you on the go. We’ll tell you how many options you have here. It’s up to you! Material: Most of the mugs on this list are made of stainless steel because it helps to keep coffee warm for longer. However, some are made of high-grade plastic or ceramic for burning hot coffee on demand. Insulated: An insulated coffee mug usually has another layer of material where the coffee actually goes, that way there is no heat lost with the coffee touching the outer wall of the mug. You’ll need an insulated mug. Handle: Does the mug come with a handle or not? This is important to some people, so we’ll let you know if any particular mug comes with or without a handle. This is especially important for glove-wearers in the winter. Hot/Cold: Does the mug work both ways? If it keeps coffee hot, it may also keep iced coffee chilled until you’re ready to enjoy it. We will tell you if that’s the case with this information. With all of that information, we’re ready to dive right into our best coffee mug reviews. Grab your favorite creamer and get ready, because you’re going to want to use these mugs immediately. Our top pick and budget pick are highlights, but some of our personal favorites are further down on the list. Make sure that you check them all out before making your final decision. Let’s get started in the best possible way. 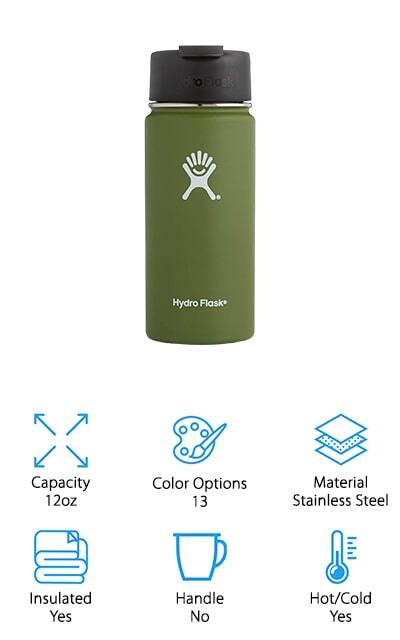 Hydro Flask is best known for its water bottles. However, it does coffee mugs just as well, as is apparent in this travel coffee mug. It comes in 12 different powder-coated matte finishes. These are colorful, but they also make sure that the mug isn’t going to sweat if you use it for cold liquids instead. It’s made of stainless steel and contains a double-wall vacuum insulation system. Hydro Flask boasts that it will keep cold drinks chilled for 24 hours and hot drinks steaming for up to 6 hours. That’s pretty amazing longevity. Your coffee will definitely survive your trip to the office. Any plastic part of the mug is made with BPA-free materials so you won’t have to worry about that. Another great perk is that Hydro Flask will donate 5% of your purchase back to a charity you choose. That’s caffeinated for a cause! The non-slip Hydro Flip Lid is another great feature. 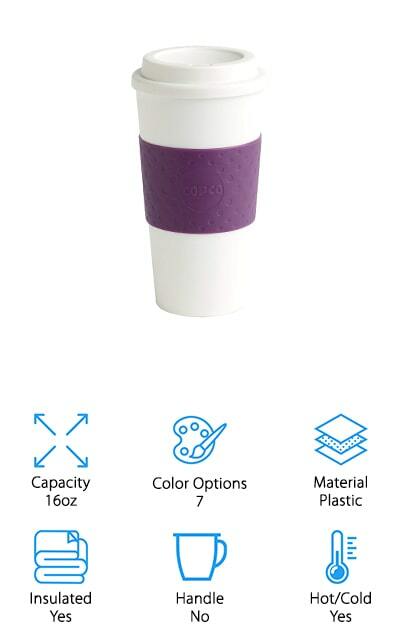 Copco makes the Acadia travel mug, which is a sturdy plastic alternative to some of the stainless steel mugs on our list. Because it’s made of BPA-free plastic, it’s much more inexpensive than comparable stainless steel mugs. However, that means that it’s durable! 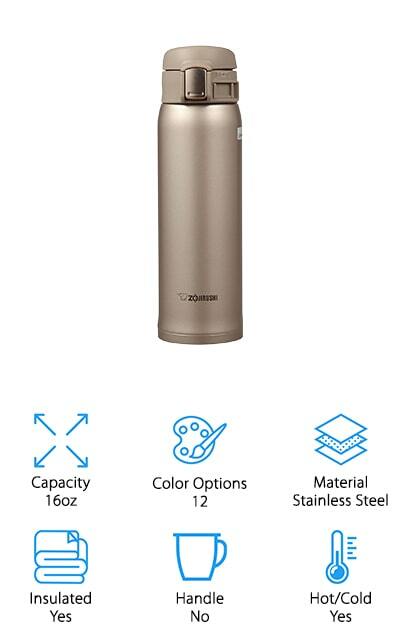 It comes with double-wall insulation to keep cold drinks cold and hot drinks steaming, so your coffee will be ready whenever you have the time to drink it. It includes a textured sleeve that won’t slip out of your grip, and you can plop it right down in your car’s drink holder because it’s a standard size. The lid has a quarter-turn design to help seal it and prevent spills and leaks. When you get home, you can throw it in the dishwasher so it’s ready for the next morning. For the price, this is an excellent mug that will definitely keep your coffee hot and holds up to 16 ounces for extended caffeinating. 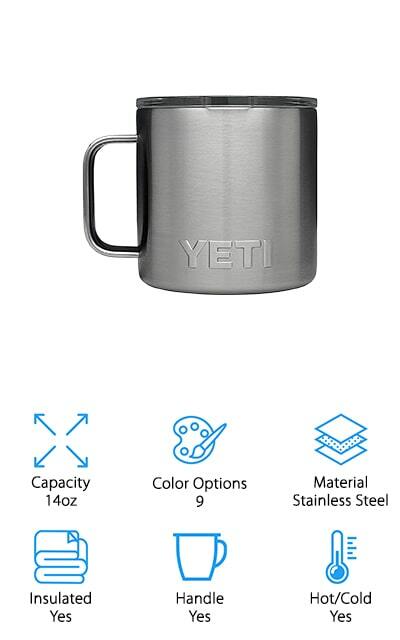 YETI is well-known for their camp cooking gear, the Rambler mug fits right into that line. The great part about this mug is that it doesn’t matter how cold it is outside, your coffee will stay hot until you’re finished drinking it. It includes a triple-grip handle so that even people with large or wide hands won’t have trouble keeping hold of it. When you’re done percolating your morning coffee at your campsite, pour it into this 14-ounce mug and enjoy at your leisure. It’s going to stay warm until you’re done with it, even if it’s frigid outside. This is because of the double-wall vacuum insulation feature that allows even cold drinks to stay chilled for an extended period of time. The stainless steel makes it durable, and the outside of the cup will never sweat. When you get home from your trip, wash it right in the dishwasher for no additional hassle. We love this camping mug! This mug by Zojirushi had to make it onto our list. There are a few features that made this mug stand out, but one of them is the fact that the stopper on the lid comes apart so that you can clean each section separately. This means that you no longer have to worry about what might be growing in those impossible-to-clean parts of your mug. It’s stress-free. This mug can hold 16 ounces of coffee and has a smaller opening so that you can maximize your space. That’s what makes this a great coffee mug. Another thing that makes it pretty amazing is the variety of color options. You can get this mug in different shades of blue, red, black, and even pink. Not a chronic coffee drinker? Choose the 12-ounce option. One of our favorite features was the safety-lock lid to make sure it doesn’t leak or come open by accident while you’re traveling. 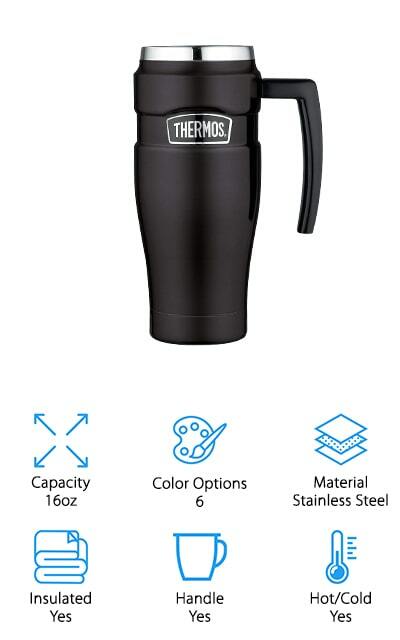 Thermos makes one of the best coffee mugs to keep coffee hot. It uses vacuum insulation technology to help in this endeavor, and they boast that you can keep liquids hot for up to 5 hours and cold for 9 hours. That means you can extend your mornings far into the day and still have enough caffeine to get you going. Both the interior and exterior are made of durable stainless steel, and that means that the exterior will remain cool to the touch when you’re drinking coffee and sweat-free when you’ve got ice cold water on board. Most auto cup holders will cradle this 16-ounce thermos with no problems at all. What makes this mug a ‘king’? It includes a built-in tea hook in case that fits better with your morning routine. Keep hold of your tea bags or infusers without losing them in the bottom of the mug. How’s that for some ingenuity? Contigo makes some of the best mugs for keeping liquids warm far past the point that you’d think they’d cool off. Hot drinks will stay warm up to 7 hours after pouring in this West Loop travel mug, and cold drinks will stay chilly and refreshing for 18 full hours. That’s an amazing length of time to get cool, fresh water. 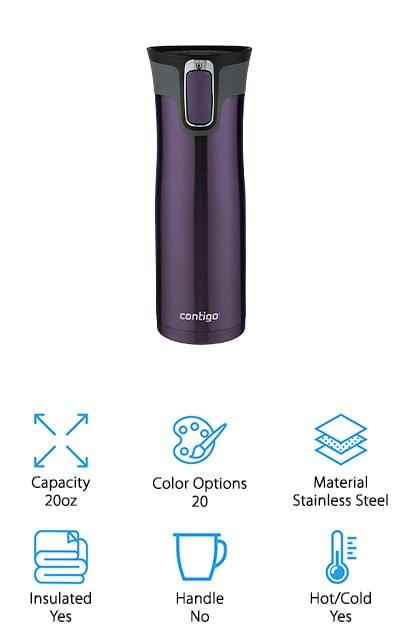 This mug, like most of Contigo’s other mugs, has Autoseal technology so that it is completely resistant to leaks or spills. You can lay this mug on your desk sideways and no one would be the wiser. You can release the autoseal with a single hand, allowing you to get some refreshment without losing sight of the task at hand. For busy people, that’s invaluable. When you want an amazing travel mug that can hold 20 ounces and will stay with you all day, this is the one for you. It’s durable and won’t leak all over the place. Thermos is back on our list with this compact bottle that has some amazing heat retention. This is probably the best coffee thermos to keep coffee hot that we could find. That’s because it boasts an entire 18 hours of hot beverages. That’s right – you can drink your morning coffee right before bed and it will still be warm. Thermos definitely knows what they’re doing when it comes to amazing drinkware. It also keeps cold liquids for 24 hours because it uses an vacuum insulation that helps lock temperatures in without any loss at all. The interior and exterior are made of durable stainless steel. The built-in cup takes this thermos into mug territory. It’s compact and can hold up to an amazing 25 ounces of liquid at a time. 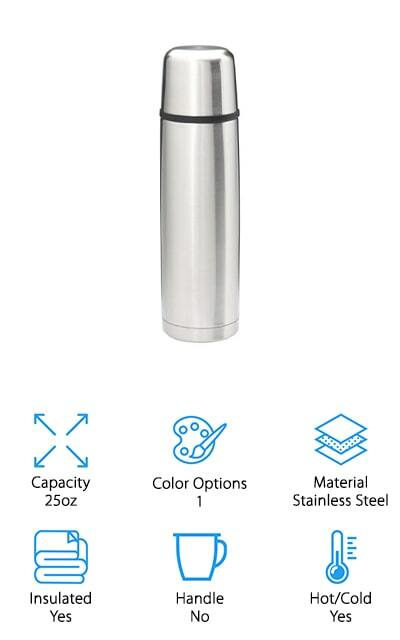 If you are looking for a travel thermos that will keep coffee warm for a crazy long time, you just have to try this one. 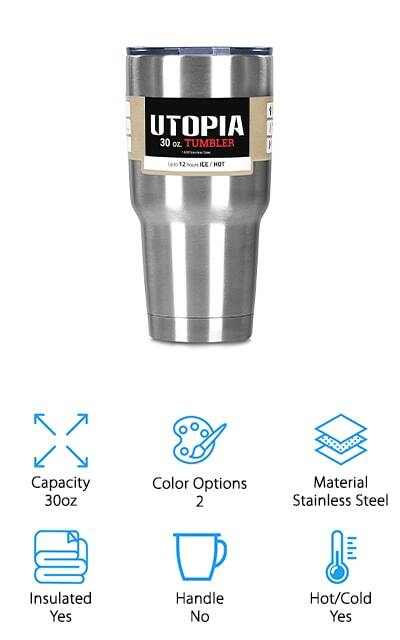 Utopia’s Tumbler holds up to 30 ounces, which makes it easily the largest mug on our list. It’s among some of the best coffee mugs for keeping coffee hot because you can keep a lot of liquid warm for an extended period of time. It’s made of stainless steel, so it won’t rust. This mug will actually last you forever because it can hold up to daily use and travel. The vacuum-insulated double-wall system keeps temperatures level and locked inside the mug. When you need to clean it at the end of the day, throw it into the dishwasher with the rest of your dishes and it’s ready to go first thing in the morning. We love how simple this mug is, and the fact that you can take so much coffee with you that you won’t have to stop at a coffee shop in the middle of the day to get over your afternoon slump. 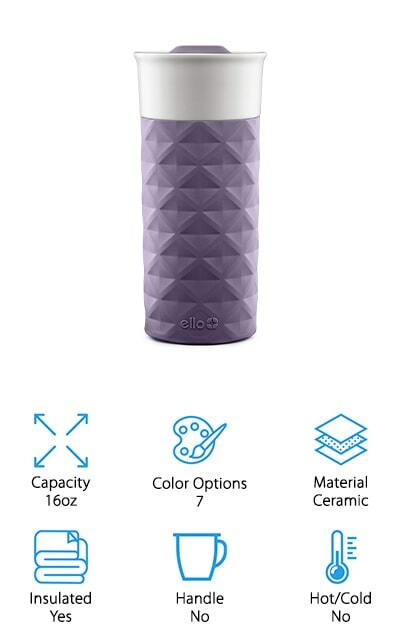 MIRA makes this travel mug that will do really well in your car. 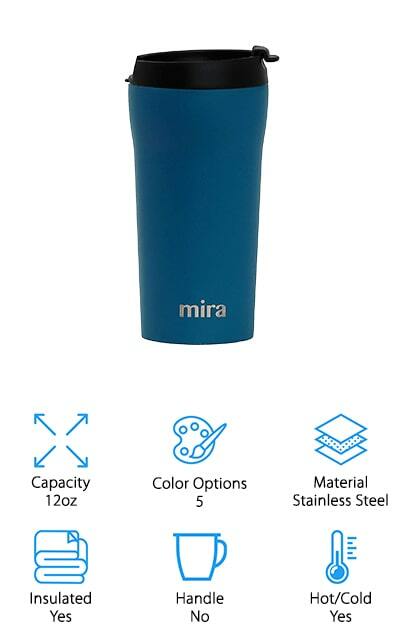 For long road trips, go with the MIRA mug. You can keep your coffee hot for up to four hours, which is great if you’re getting it at different gas stations along the way. Otherwise, keep cold drinks chilled for up to 8 hours. All parts of the plastic lid are made of BPA-free materials and are free of toxins so you can drink without worry. The 12-ounce version of this mug holds just enough coffee to get you through a tough morning or a long stretch of road without overdoing it. It’s got a powder-coated finish so you can keep hold of it even while you’re driving, and you can use it for just about any drink that isn’t carbonated. It’s a stainless steel triple-wall system that will keep the outside cool and sweat-free no matter what is inside. Turn to MIRA for consistently hot beverages. Ella Ogden makes one of the best coffee cups to keep coffee hot for long periods of time. It’s a ceramic mug, which means that it’s made of almost the exact same material as the mugs you have at home. The difference is in the insulated silicone boot that will help to keep your coffee hot for as long as you need it to. It far surpasses the heat retention of your regular kitchen mugs. Every part of this cup is dishwasher safe, and the splash-proof lid slides open when you need it so that you’re drinking right from the ceramic lip rather than a plastic lid. Still, all plastic parts are BPA-free. If you have chronically cold fingers you might consider a ceramic mug, because warm liquids will heat the outside of the mug as well. Don’t suffer all winter with cold coffee and frozen fingers! With this ceramic travel mug, you don’t have to.